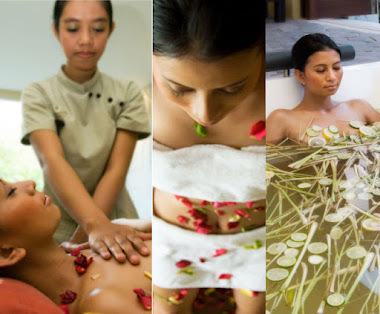 This treatment packages is a traditional Balinese ritual which is begin with a Balinese full body massage, and then continued with a lulur bath (body polishing using scrub) and finished with a Flower Bath. Mandi Lulur is Indonesian words means ”Lulur Bath”. Lulur is paste form of traditional herb, flower, seed, grain or fruits that believed would bring good benefits for skin. The Lulur usually made of Sandalwood, rice grain, jasmine, green tea, milk, chocolate or any other natural material. Mandi Lulur is a secret of asian beauty and becoming part of ritual. The Lulur bathing is a body polishing practice to moisturize and soften the skin. The Lulur paste applied into the body, left it dried and then rubbed off gently. Counseling, oil head massage, hand & shoulder Shiatsu massage, twin Abhyangga, facial, body mask, Shirodhara, flower bath, shampoo & blow, brunch. Medical Summer is a spa packages blended with inspiration from the ancient Ayurveda, healing method originated from India. The 3 hours duration started with a counseling to determine dosha body type, to pick certain oils that fit your body type based on Ayurveda teaching. The treatments sequenced to Oil Head massage, Abhyangga, Foot Mask, Shirodhara, Flower Bath and lastly a shampoo and blow. Spa Menu: Counseling, oil head massage, hand & Shiatsu massage, Ayurvedic point facial, body scrub, shower, Ayurvedic full body, honey body mask, Shirodhara, milk bath, shampoo & blow, brunch. The origin of Aviangga is from India. This Massage is a soft massaging technique by using therapist’s palm hand. With a selected warm oil based on spesific client body type (Dosha), a therapist will do a gentle massage to make the essences of essential oil being absorbed by the client body. The last sequence of Aviangga is “wraping technique” which has a detoxifying purpose. 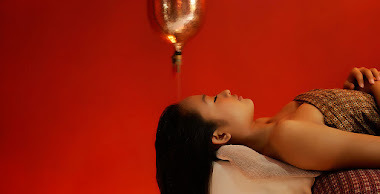 Instead of one single therapist as in our regular Aviangga Treatment, the Twin Aviangga performed by two spa therapists to bring maximum benefit of Abhyangga Treatment. Our fully trained therapist will perform a soft massage and let your body absorb the oil which is carefully selected based on your “dosha“, type of your mind and body according to Ayurveda. Abhyangga Treatment keeps bodies balanced, healthy, and focused. Experience the heritage of Ayurveda for healthy skin and anti aging. With combination of herb oils and Aura Spa Jimbaran’s Ayurvedic massage technique, the 1 hour Ayurvedic Full Body Massage at Aura Spa Jimbaran Bali will be enchant your ordinary day. With many choices of Cream, from Avocado to Aloe vera, from Herbal to Multi-vitamins, combined with excellent therapist skill, Cream bath in Aura Spa Jimbaran will not only meet your hair need but it also will put you into a deep relaxation state. Book a Facial Treatment at Aura Spa Jimbaran Bali for your ultimate beauty care. Our Facial treatment will cleans, nourishes and ex-foliates your skin to promote clear, well hydrated skin. Get relaxed and enjoy the Aura Spa’s Flower Bath or Milk Bath. 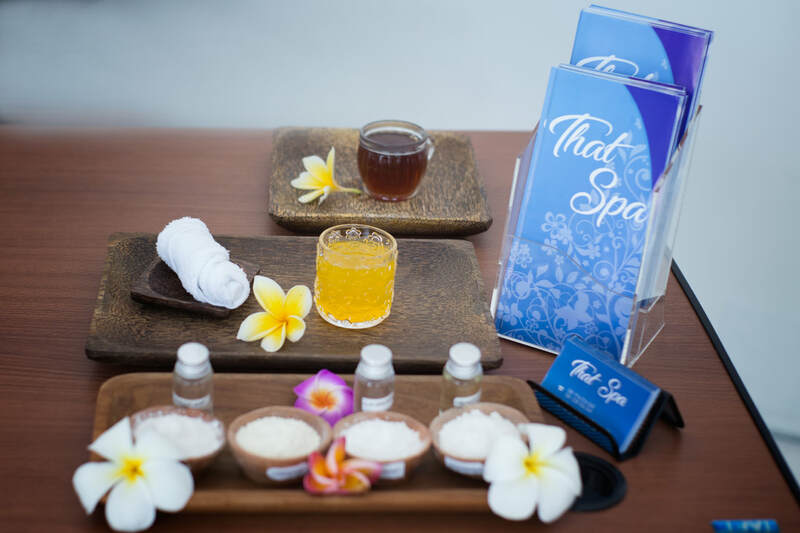 With fresh flower petals picked from the tropical Bali land, it will put you on the deepest relaxation you ever imagine. The Milk Bath will moisturizes and soften your skin, relieves stress and accelerates skin cell renewal. This is a combination of Balinese full Body Massage and Hot Stone. Instead of using palm hand, the massages performed by using warmed stone to give pressure, rolling and long strokes to the body. The Hot Stone Full Body massage will improve blood circulation, reduce stress and ease tension. Tender Breath is a 3 hours Spa treatments consist of Mandi Lulur, cream bath or facial, flower bath. Mandi Lulur is a practice of body polishing by using traditional scrub in paste from. The ingredient usually natural herbs, flower, tea, coffee, chocolate, milk, yogurt, etc. After the Lulur Bathing ritual, a choice of hair creambath or facial will enchant and complete the treatment of skin, hair or face (depend on your choice). And to finalize the treatments, enjoy a relaxing flower bath. 3 hours in duration, the package inspired by India. Started with Indian style head massage and then continued to soft and oil massage of Abhyanga , aromatic herb, meditative Shirodhara and relaxing milkbath.